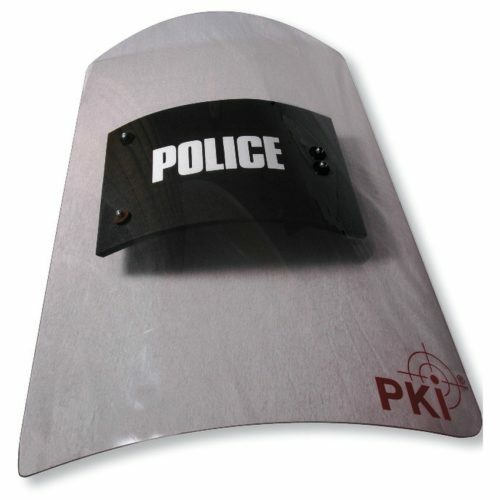 The PKI 9150 Protective Shield is a must for any police and security task force. PKI 9150 Protective Shield already has proved its efficiency in many actions against terroristic acts, riots and demonstrations. Due to the clear visibilty of the polycarbonate material the wearer is protected against most common attacks in riot situations but still has a full survey about critical situations. A specially constructed supporting holder with leather-coated handgrip and swiveling armrest provides comfortable wearing either on the right or left arm. The curved shape of the highly resistant shield deflects any thrown objects and affords perfect and fullbody protection to the wearer. Each shield can be supplied with a specific and tailor-made label or Insignia as per customer’s requirement.